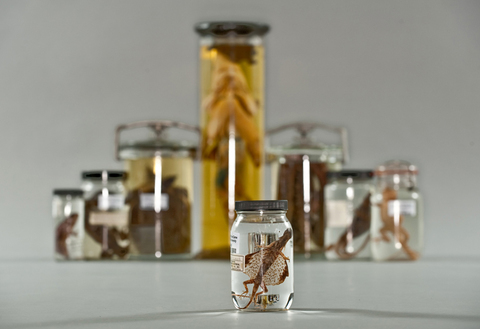 A working repository of rare and scientifically significant biological specimens. The Museum of Biodiversity showcases the Department of Biological Sciences’ extensive collections of amphibians, fish, birds, mammals, insects, parasites, and fossils that have been collected over the last 150 years. As part of the museum, the herbarium preserves the fragile and delicate collection of dried and pressed plants of the Greene-Nieuwland Herbarium. Rev. Edward Sorin, C.S.C., Notre Dame's founder and first president, obtained Notre Dame’s first natural history museum collection through an exchange with a physician for land Sorin held near Detroit. The display was ready for the University’s first commencement exercises in 1844, and was an attraction for local visitors. It mostly was destroyed in the 1879 fire that consumed the Main Building and Rev. John Zahm, C.S.C., was assigned responsibility for rebuilding the collections. For more than 50 years the natural history collections occupied part of the first floor and the entrire second floor of the old Science Hall — now the LaFortune Student Center. The collections moved with the Biology Department, first to Haggar Hall in 1952, and then to the newly constructed Galvin Life Sciences Center in 1971. They now occupy a portion of the first floor of Jordan Hall of Science, with a display area that faces the main Galleria. Flying Lizard. One of the many items in the museum's collections.